Amie is an illustrator and all round creative from Canberra, Australia. 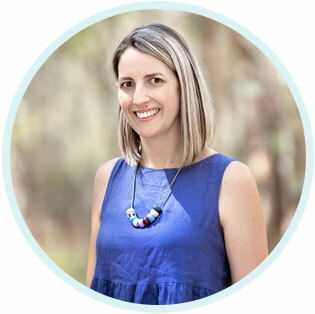 Writing about her adventures in illustration and her love for children's books. Over the last month or so I’ve been working on quite a few “basic” designs which I’m planning on using for multiple projects such as wrapping paper and laser cut brooches. Although these designs come across as smooth and basic, I have spent a lot of time in illustrator just playing with the shapes and lines to come up with balanced, cute and original designs. Here’s a sneak peak of a few of the things I’ve come up with so far. It’s been a while… too long in fact since I have done an Illustration Friday entry. 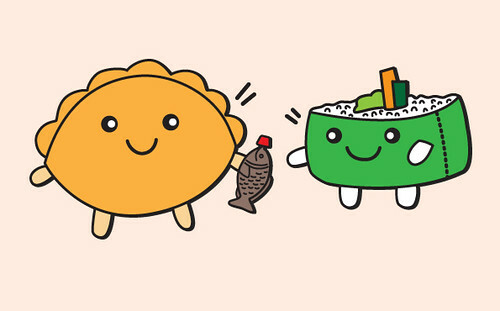 The topic this week is “gesture”, I’ve drawing a dumpling offering the sushi his soy sauce… what a lovely gesture that is. A few moths back I saw some amazing ornamental ceramic cats own by my lovely friend Jess, they were so pretty they just stuck in my mind and popped up in my dreams, so I decided to do an illustration using their basic shape & style. 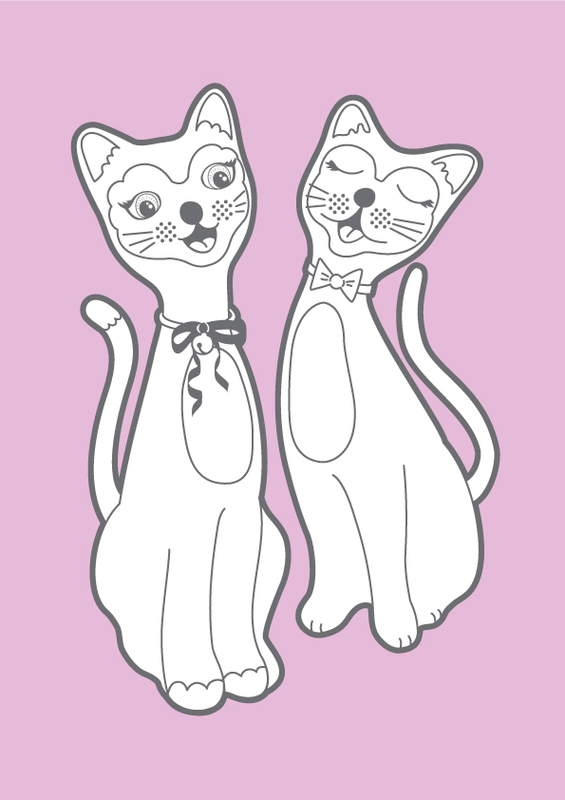 These kitties will be the basis of my next gocco print design, I would kind of like to spend more time on details and embellishments to make them better… but I would probably never get to a point that I would consider finished, so simple kitties they will stay. Here is a photo of the ceramic cats mentioned above. I thought I’d take a quick moment to share with you artwork by my favourite gocco print artist (so far) Julie West. I love the lines in her illustration and the colour combination’s she uses. 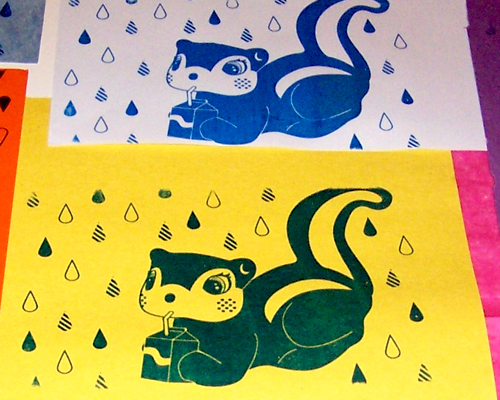 She also does some great letter press work and vinyl toy design – two things I’d love to play with one day. You can see more of her work at the Julie West shop or the Julie West Flickr stream. 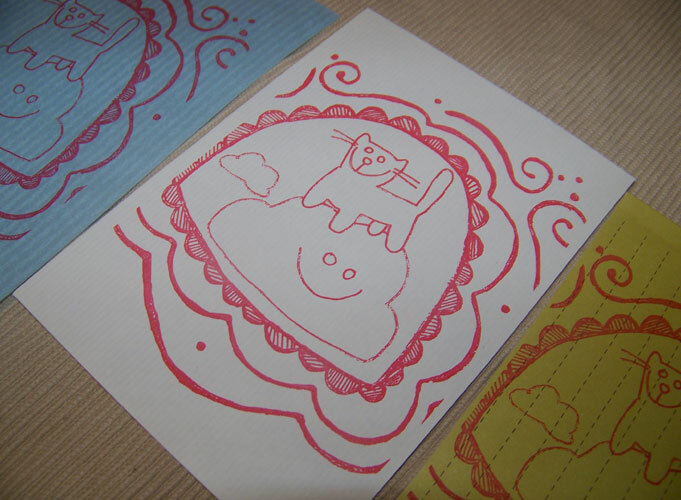 Today I worked on getting some more gocco prints done. I’m fairly happy with the results and glad I now have some more Moleskin notebooks with prints on them which might go in my one day to exist Etsy store… something I really should get onto. Although I’m happy with the results there was no real creative achievement as I used an old design. I really should have tried something new like using 2 different coloured inks. Creative fail but on the positive side I think I improved my ability to clean the sticky gocco ink off of the master without ruining my house, furniture and clothes, and I have something to move forward from. 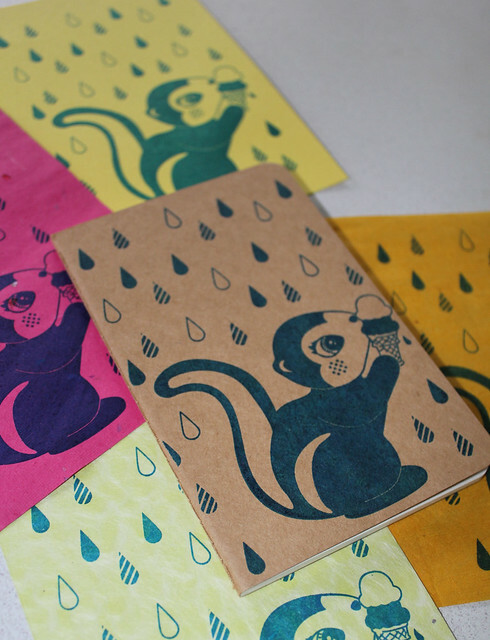 Print run preparation - Preparing with pre cut paper and moleskin note books. Some varieties of paper work better than others… I am still testing grounds and working out the best stock for printing on. Inking the master - As you can see the master is stained green from the last ice-cream squirrel print run - this happens. it's pretty much impossible to clean a master to it's original state… luckily it doesn't effect the next round print quality at all. Thanks to the ever lovely Teeje from twitter, I was yesterday reminded about a little project I worked on some time back. 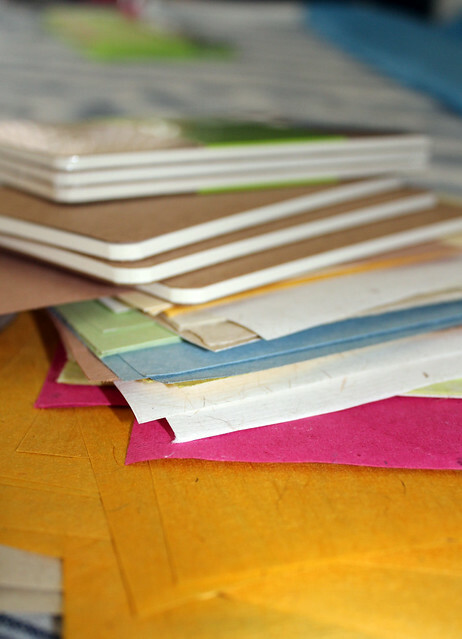 I was at the time inspired to create notebooks from the unused paper in old art books, note pads, school exercise books etc as I was throwing a lot of that stuff away. In the end I just made one… and quite ironically I never gave it away or used it because I felt kinda too proud of it (being my first attempt and all) and didn’t want to ruin it. 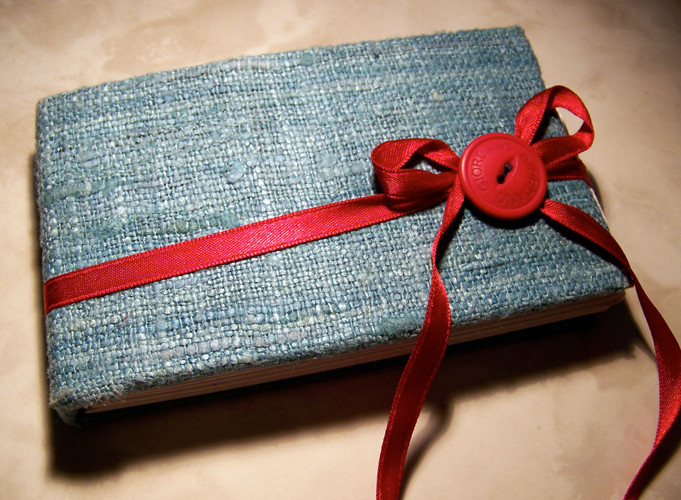 I’m now planning to make more recycled notebooks over the next couple of months. 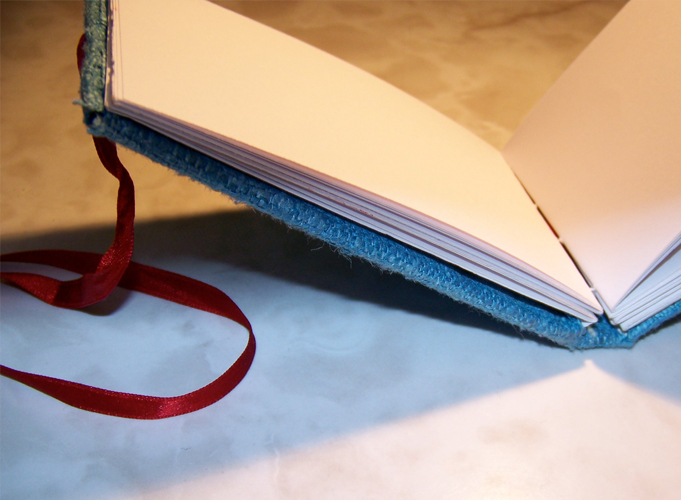 If you are a bit of a crafty duck like me, I’d highly recommend recycling unused materials and put together your own notebooks too! Please check out Teeje’s Tumbler post – “My version of craft heaven”… which in the long run sends you to a fantastic tutorial by Design Sponge. Have fun! This week’s Illustration Friday theme is “breakfast”… here is my entry. 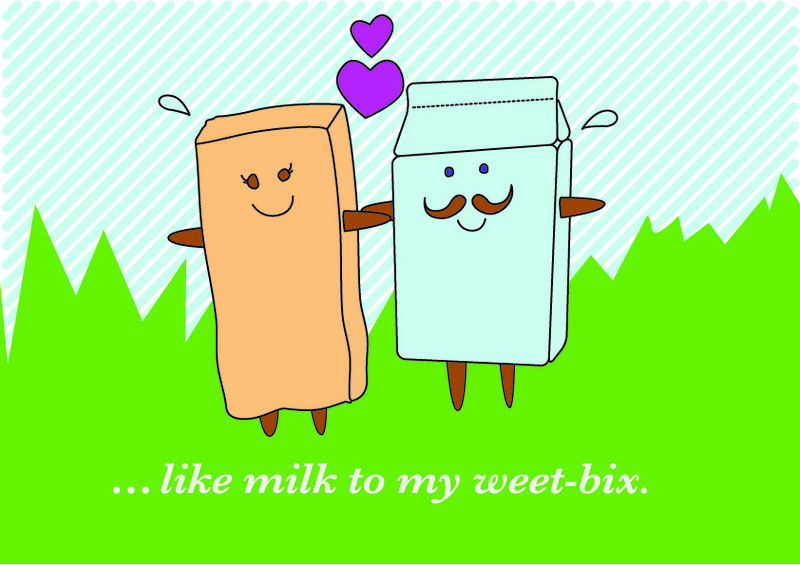 I am the weet-bix, the moustached milk carton is my lovely boyfriend Joel. My first take at this illustration was just under a year ago when I made it into an e-card for his birthday… I modified it a bit for my Illustration Friday entry. 1. It’s kinda hard to even out paint in large inked areas (like the squirrels body), I’ll be trying to include more patterned or lined areas next time. 2. I need to my designs a bit smaller… as Mr Squirrel’s tail got a little chopped off this time. I think I actually learnt this in round one… but I forgot. 3. Definitive white lines like those around this paws/leg need to be a little thicker – on some prints they were barely visable. 4. 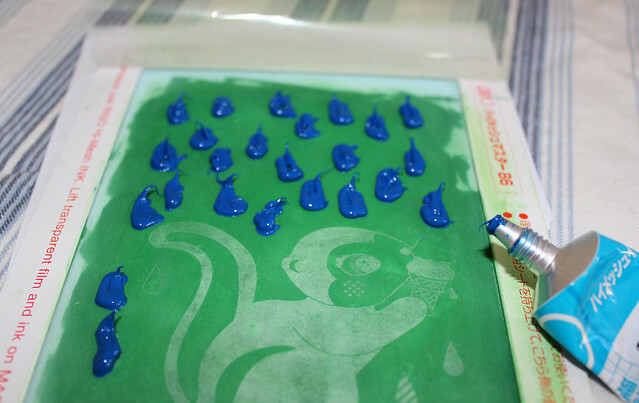 Gocco ink is ridiculously sticky and you need to be well resourced for cleaning your master screen after… have more than 2 pieces of paper towel ready.